According to the latest rumors, Apple is working on a something called “iWatch”, which is a smart watch project. Now Bloomberg reports that Samsung has confirmed rumors that they are also working on a smart watch, it appears that the two rivals will be going head-to-head yet again as the battle over mobile devices widens. Lee had no comment on what features the watch may have, how much it would cost and when it would go on sale. 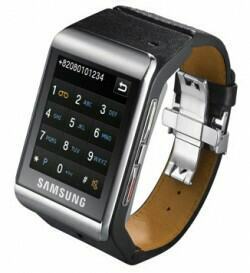 Samsung already has some experience in making smart watches, as you can see in the image above “which is their Samsung S9110 watchphone“. This can be an interesting battle, especially because Samsung may be able to offer a pricing advantage over Apple given that it controls its own chip and display production, undoubtedly two of the highest-cost components of a smart watch. Apple however “has been reported to have 100 product designers working on its smart watch project, toying with curved glass and considering such features as biosensors and mapping functionality. The watch will also reportedly run a “full” version of iOS, making for easier integration and developer access.” But “probably because it is running a full version of iOS” the battery life of the device is said to be a challenge for Apple.